For a durable flooring option that offers lasting quality all at a more affordable price than other alternatives, homeowners cannot go wrong in turning to vinyl tile flooring. This particular type of flooring offers considerable resilience against wear and tear, such as scratches and stains, and is remarkably easy to clean, offering a low maintenance tile option. Due to the design of vinyl tile flooring it is also easier to install than many flooring alternatives, which allows you to save on labor costs and time. 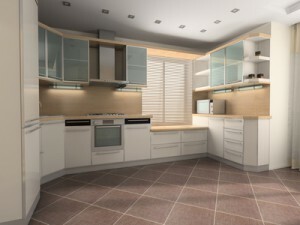 Vinyl Tile Flooring offers a host of advantages over other options. Some of these include that the majority of vinyl floors have warranties extending from 15-20 years, so you can rest easy knowing that you are getting substantial lasting quality out of your investment. With an extensive amount of options available you can find any color, style, or design of vinyl tiles that suits the look of your home’s interior design; wood plank and stone tile patterns are even available to give that luxurious quality that you are after. When you call for assistance you are getting the best in quality service from the premier remodeling company. We are attuned to the needs of our customers and are able to supply the best in manufactured flooring backed by only the most skilled installation services. Our team of qualified builders is well-versed in their field and can handle all aspects of your design, remodel, and repair needs. In addition to offering you the best workmanship, we back all of this with exceptional customer service. We know that you don’t like surprises when it comes to your bills, so we offer upfront pricing before the project even begins, and will work with you to make certain that everything falls within your allotted budget.